Gender-based violence (GBV) transcends borders and cultures; it is a global issue affecting millions of people each year. An estimated one in three women worldwide will experience gender-based violence in her lifetime. During the international campaign,16 Days of Activism against Gender-based Violence, organizations and agencies such as USAID are highlighting our collective efforts to eliminate violence against women and children. Gender-based violence is a pervasive barrier to women’s empowerment. We know that gender-based violence is often significantly amplified in complex crises around the world, and threatens to undermine the health, safety and rights of women and girls. This violence also threatens to stall, or even reverse, the important development gains made in many of the countries in which USAID works. As USAID’s Administrator Mark Green has noted, conflicts and natural disaster have led to the displacement of millions of people around the globe. In such times of uncertainty and turmoil, family, social and legal networks tend to break down, increasing the exposure of women and girls to gender-based violence, and frequently limiting the ability of survivors to safely access lifesaving treatment and support in their attempts to recover. The United States government has adopted ground-breaking policies on the role of women and girls in U.S. foreign policy and assistance. In the recently approved Women, Peace and Security Act of 2017 the U.S. has laid out important goals and guidance for protecting and empowering women and girls and lay the foundation to enhance efforts to keep women and girls safe during both conflict and natural disasters. As depicted in the infographic below, USAID has a strong commitment to addressing GBV. The agency has already reached more than five million survivors of gender-based violence with potentially life-saving services. USAID is also working, through its programming, to proactively prevent this violence. During the 16 Days campaign, we encourage the Agrilinks community to learn more about the issue, starting with this USAID toolkit developed to support the implementation of the U.S. Strategy to Prevent and Respond to Gender-Based Violence Globally. While its focus is integrating GBV prevention in economic growth programs, it offers a useful framework and set of tools for programming across sectors. USAID also offers gender-based violence toolkits for sectors such as education, health, energy and infrastructure, and rule of law. We also invite contributions on successful approaches and other perspectives on GBV. 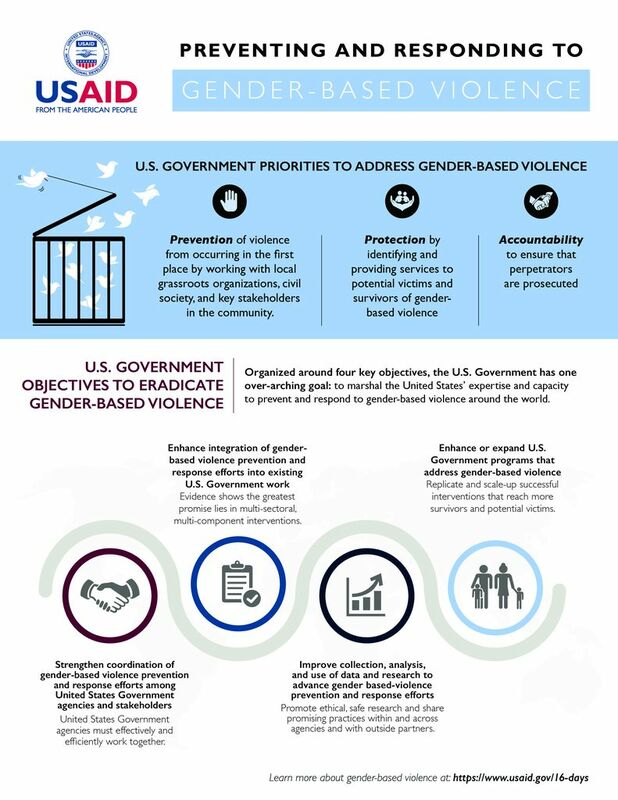 Learn more about USAID’s work to prevent and respond to gender-based violence at https://www.usaid.gov/16-days.